Martin’s proprietary Nickel/Copper alloy blend wrap wire provides for a reduced pick attack and allows the guitar’s tonewoods to be heard, not overshadowed. It offers a uniquely mellow, yet crisp, sound. Martin’s wrap is a solid Nickel/Copper blend, not nickel-plated, meaning there is no chance for defects to allow for corrosion. 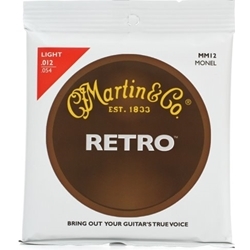 Martin's proprietary wrap is naturally strong and corrosion-resistant.